Within the pages of Claire Evans new book, Bible-Time Stories and Rhymes, ($52.49, paperback, 9781545610084; $62.99, hardcover, 9781545611746; $6.99, e-book, 9781545610091) readers will enjoy a fifty-two-week family devotional designed for parents who want to share God’s Word with their children. Filled with charming rhymes, the book will bring families joy every week. Claire Evans is a devoted mother of two and seeks to strengthen Christian families through her writing. To this end, Claire developed a Bible story curriculum entitled Bible-Time Interactive Family Devotional for preschool-aged children. Xulon Press, a division of Salem Media Group, is the world’s largest Christian self-publisher, with more than 12,000 titles published to date. 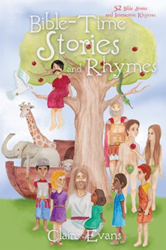 Retailers may order Bible-Time Stories and Rhymes through Ingram Book Company and/or Spring Arbor Book Distributors. The book is available online through xulonpress.com/bookstore, amazon.com, and barnesandnoble.com.